Introducing Cumulative Flow Diagrams in ZenHub! Agile comes in many different flavours, and our goal with ZenHub has always been to provide teams with a way to work closer to the code regardless of what methodology they’ve adopted. That’s why today we’re excited to announce the first, of many, coming features aimed at making it even easier for Kanban based teams to track progress using ZenHub: Cumulative Flow Diagrams. What is a Cumulative Flow Diagram, Anyway? Unlike ZenHub’s Burndown, Velocity, and Release reports, Cumulative Flow Diagrams aren’t based on Estimates (Story Points). For this reason, they’re a great way for non-Scrum based teams to visualize and understand how Issues are progressing through the Board. Each coloured area of the report represents a pipeline within your workspace, with the vertical height of each area representing the total number of issues within that pipeline at a point in time. As new work is initiated, and Issues are added to the Board, the Diagram makes it possible to visualize how those Issues are moving through the different stages of the workflow. In this first release, the Diagram gives teams the ability to track the throughput of Issues over the past 14 days, 30 days, 3 months, and 6 months. By visualizing the number of Issues within a pipeline, Cumulative Flow Diagrams make it easy for teams to identify bottlenecks where work is piling up. For example, if the volume of Issues within your team’s Review pipeline is continually growing, this might serve as an indicator that more team members need to get involved in reviewing Issues and Pull Requests. Beyond identifying bottlenecks, Cumulative Flow Diagrams can also provide indications as to where the team might benefit from workflow changes and process improvements. For example, if your team is continually finding that your In Progress column is growing while your Review pipeline remains flat, that could indicate the need to implement work in progress (WIP) limits. While these process changes will differ from team-to-team, Cumulative Flow Diagrams make it possible for teams to have proactive conversations and take action before important projects and deadlines are put at risk. In the true spirit of Agile, it’s these insights that facilitate the ability for continuous learning and improvements in the way teams deliver software projects. Ready to get started with Cumulative Flow Reports? Visit the Reports section of ZenHub and select ‘Cumulative Flow’ to start visualizing your workflow. For more information on how your team can make the most of this new report, check out our help centre. Two New Ways to Filter Your Boards! 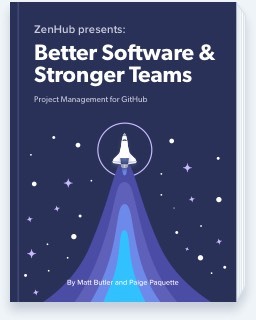 Build better software & stronger teams. Our new book is packed with real-world strategies and expert advice your team can use today. ZenHub is not affiliated with GitHub or any companies mentioned as users of our product. All other trademarks and copyrights are property of their respective owners. Click “Add Extension” to allow ZenHub to run natively in your GitHub user interface.